Boys love their toys … the fire buster can throw fire-killing foam a long way. 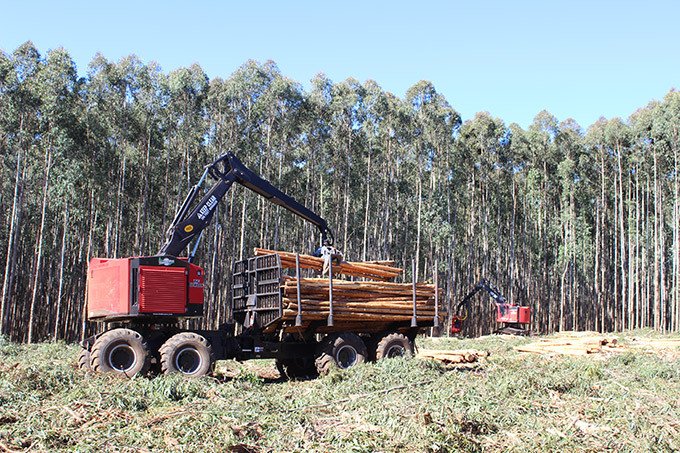 The keenly anticipated Focus on Forestry conference held at Cedara in the KZN midlands in April went off like clockwork and provided delegates with plenty of useful, practical info to take back to their own businesses. Similarly the field day provided an opportunity to view new technologies and innovations in action in a plantation environment. 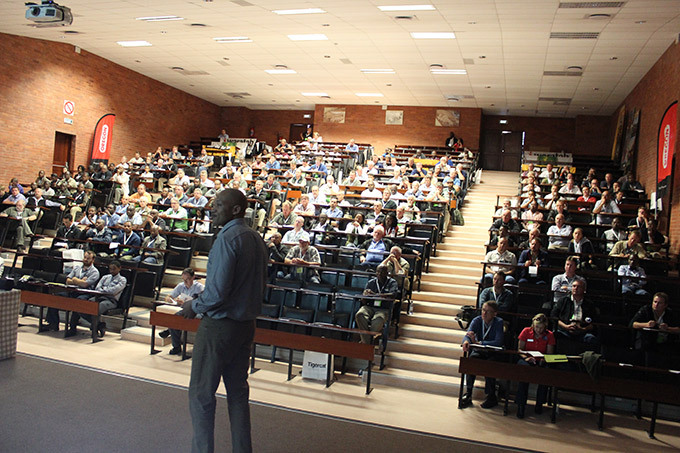 Michal Brink of CMO, organisers of the event, told delegates that the first Focus conference was held 30 years ago with the aim of providing a platform for foresters to share ideas and “take forestry in South Africa forward”. The Focus conference, now held every two years (the next event is in 2019) is still providing that platform and was thoroughly enjoyed by close to 300 delegates. The keynote address was delivered by scenario strategist Chantell Illbury. She said that businesses in South Africa need to “think like a fox”, be quick and agile and adapt to the future that unfolds. The business environment is characterized by globalization (strong economic inter-connectedness), digitization (technology is shifting the balance of power away from organisations towards consumers) and technological conversion (e.g. advances through biotechnology and nanotechnology). Regarding the future for SA, she rated our chances of remaining in the Premier League at 30%, our chances of being relegated to the 2nd Division at 60%, and of becoming a failed state at only 10%. So despite our recent downgrade to junk investment status, it is not all doom and gloom on the home front. Mark Barnardo of Sappi presents on day one. George Theart of ATFC (Mozambique) Madeiras e Agricultura SA provided insights into the challenges of establishing greenfields forestry projects in Africa. He said “respect and humility” should be the dominant corporate culture, and “arrogance” would lead to certain failure. He stressed the importance of individual-based community management. “I have yet to find a homogenous community – you must deal with individual aspirations,” he said. Mark Barnado of Sappi spoke about human capacity building through the application of technology. “It’s all about relationships … put humanity before machines”, he said. Dean Da Costa provided some insights into Mondi’s ‘modernization’ journey. He said that at Mondi planting productivity had flatlined for 30 years, and that modernization had resulted in “exponential productivity improvements”. But you have to maximize the potential of each plantation according to its own unique challenges – you can’t just “throw technology at it” and expect miracles. He said the modernization goals achieved at Mondi over the last three years were “better than expected”. 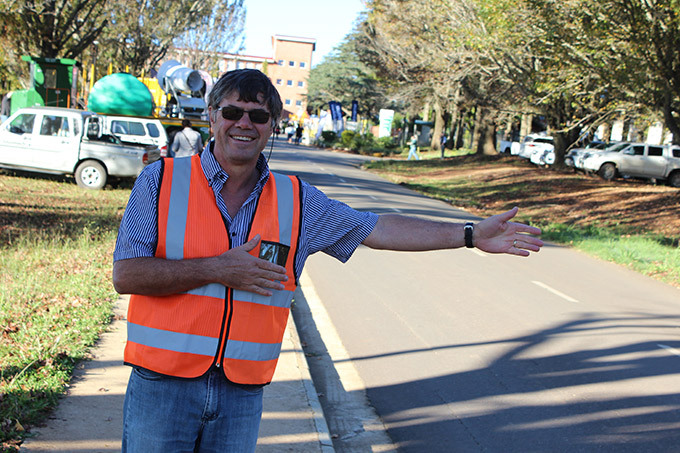 Two days before the conference Michal Brink of CMO was flying back from an assignment in Liberia, the day before he was on his knees laying paving outside the conference venue to smarten the place up, and on the morning of the conference he was directing traffic to ensure delegates found safe parking. This man never stops working … or smiling! 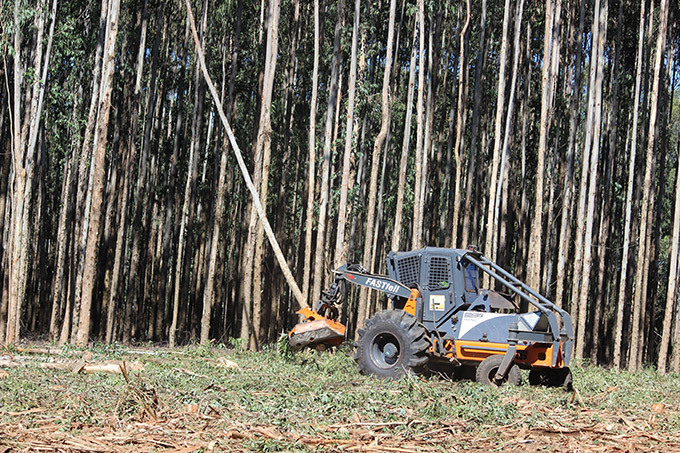 Jeffrey le Roux spoke of the myriad of benefits that had come from mulching instead of burning after harvesting across Sappi’s Zululand plantations. He said the reduction of TU areas adds massive value, and the elimination of stumps provides many opportunities for improved silviculture applications, fire protection and harvesting options. However the quality of the mulching is imperative. 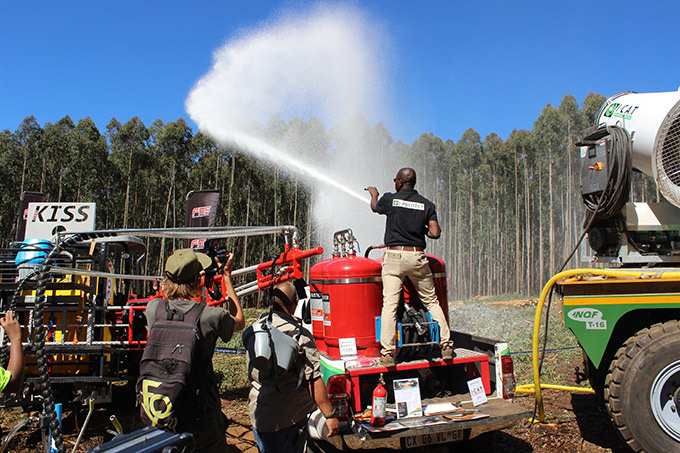 Jurgens Kritzinger of Montigny, which owns the Usuthu plantations in Swaziland, described their innovative fire protection strategy which is designed to avoid the massive fires such as those that destroyed the plantations in 2007/8. They looked at the history of fires in the plantations, and discovered that in the old days there were fewer fires, less damage, better roads, good relationships with neighbouring communities and own operations. As time went by the ownership changes led to outsourcing of operations, unhappy people and more arson fires. He said Montigny has turned the ship around to go back to 1984, re-introduced own ops using their own people and own equipment, put huge emphasis on building community relationships, invested in improved roads, planted dynamic wattle belts and have employed a military expert who has helped them adopt a military-style approach to fire preparedness. Andrew McEwan of CMO and Gary Olsen of Tigercat, placed much emphasis on the new technology being utilized to push harvesting machines onto ever steeper slopes, as well as ergonomic advances ensuring the comfort and safety of operators. 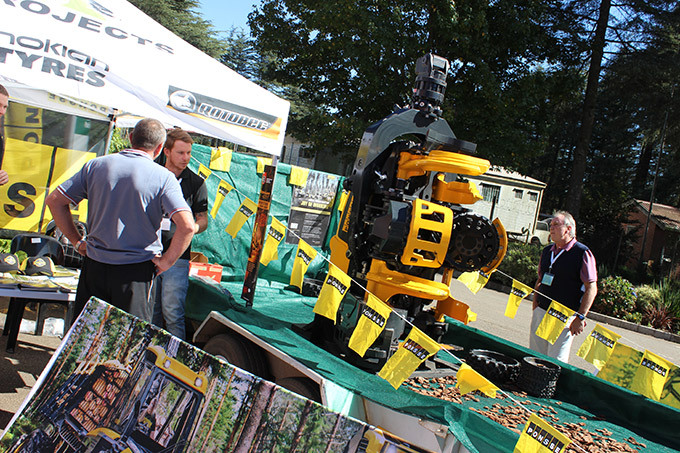 Peter Alpass of Alpine Logging discussed the latest innovations in steep slope logging using cable yarders, skylines and shovel yarders. 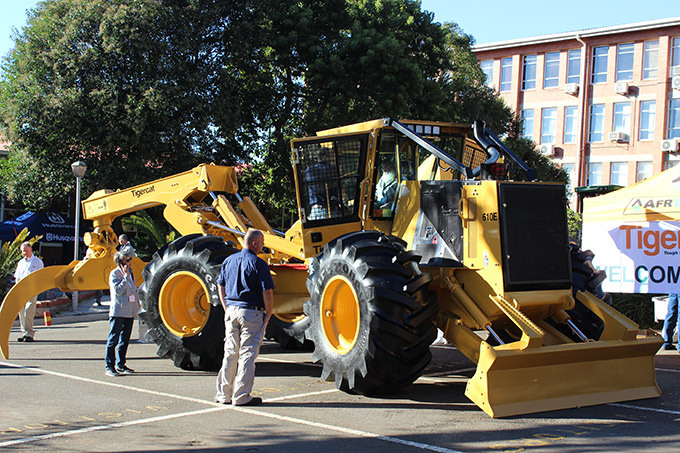 The brand new Tigercat 610E skidder, just landed in SA, was on display at the conference venue and field day. Phillip Hall of Forestry Plant and Equipment gave an interesting insight into how simple decisions, which are often made by young, relatively inexperienced foresters in the field, can have a huge impact on the productivity of contractors, with potentially serious negative impacts on cashflow. He said that young foresters should be required to spend time working with contractors – before being promoted to contractor managers. “We need a new breed of technical foresters,” said Phillip. 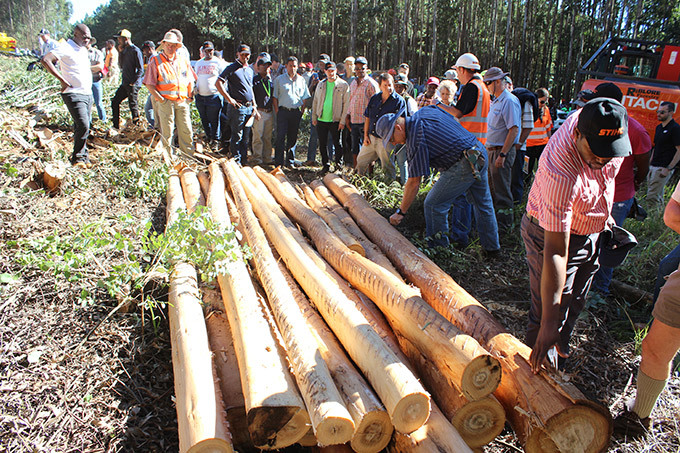 “Foresters are getting younger and younger, while contractors are becoming older – and fewer,” he concluded. Benno Krieg of Bostek described the massive challenges faced by contractors having to harvest cossid moth-affected E. nitens compartments in the Mpumalanga Highveld. 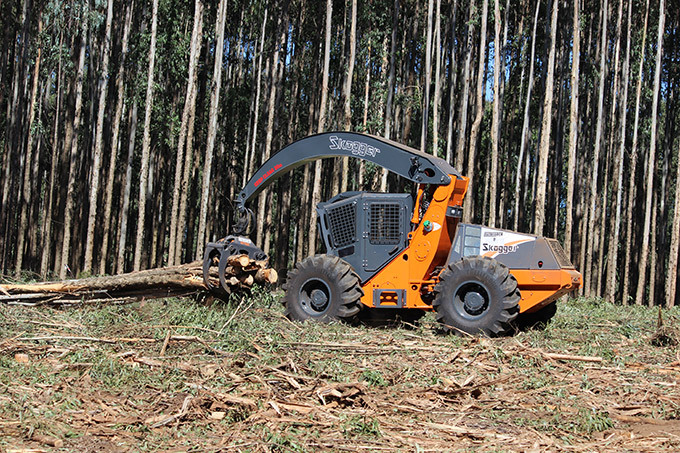 Expect lower productivity of harvesters and forwarders, lower timber yields, increased equipment wear and tear, disillusioned operators and poor cashflow. The sooner you get trees affected by this pest down the better, as it only gets worse and the trees won’t recover. He said there should be flexible rates structures in place for contractors required to work in these situations. The field day was held in fine, sunny conditions on day three of the conference. 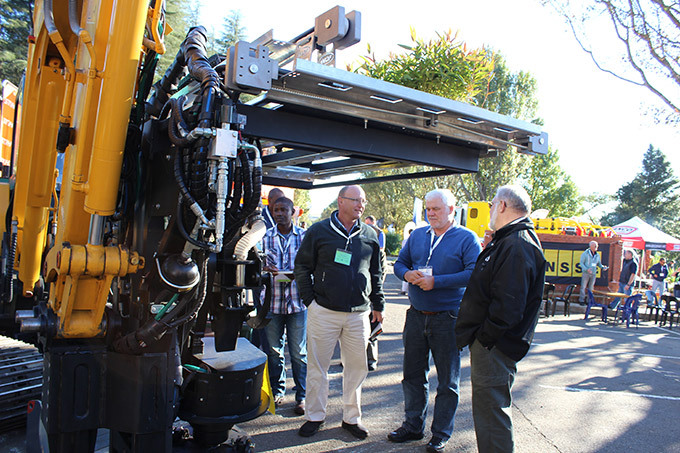 Among the highlights of the live and static demo’s was the innovative equipment being designed and manufactured right here in South Africa, giving the mechanization journey a decidedly local flavor. 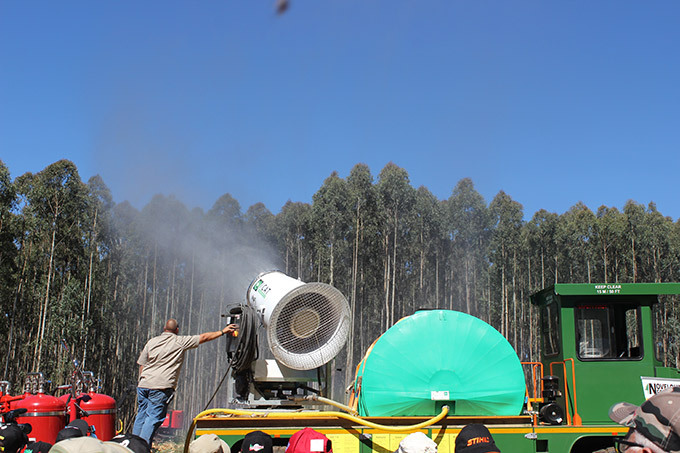 The mist blower from I-Cat mounted on a Novelquip carrier can damp down a fire over a large patch of plantation. The no-nonsense TimberPro forwarder in action while the harvester, armed with an SP 761 LF head, fells, de-barks and cross-cuts in the background. 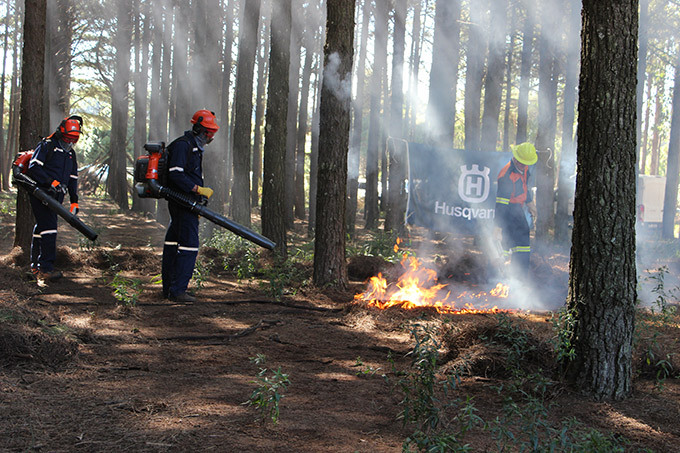 The Husqvarna blowers easily controlled this under-canopy burn in a pine compartment. Matriarch Equipment’s innovative FASTfell at work. It is distributed and supported by Bell. The tough and versatile Skogger – designed and built in SA – has been geared up by Matriarch and added to the Bell stable. Novelquip Forestry’s latest one-stop pitting/planting/gel/fertilizing machine gets some serious attention. Ponsse’s H7 Euca head, optimized for harvesting and debarking eucalyptus and acacia, getting the once-over. 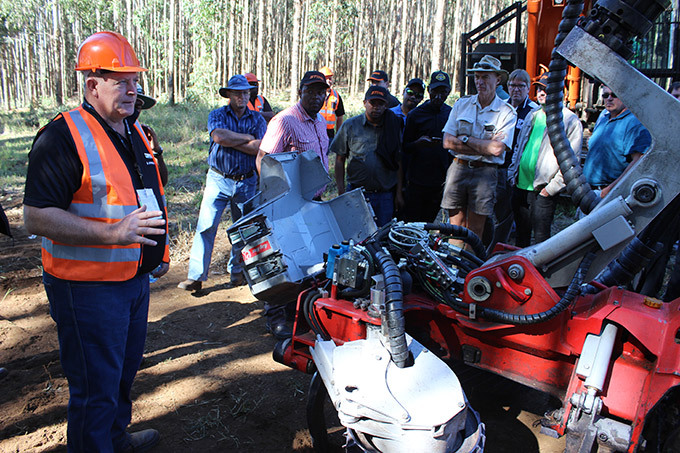 Flip Breytenbach of AfrEquip explains the finer details of the Log Max E6 harvesting head. Foresters check the debarking quality after the Log Max has done its job. 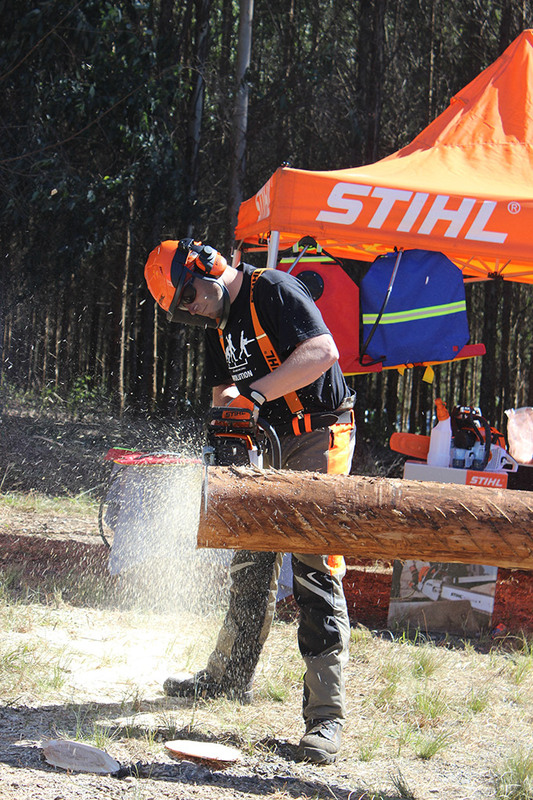 Stihl’s new MS 382 is a blur of speed and precision cutting. 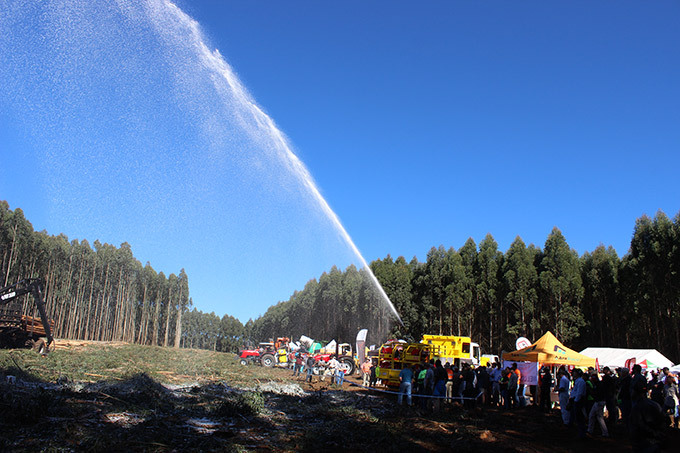 The field day was held on a beautiful day in the KZN midlands.